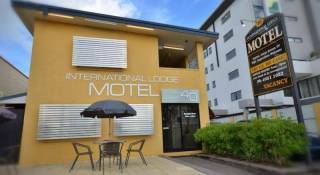 Fully renovated rooms have full cooking facilites, air-con, tea and coffee facilities, M'wave/Convect oven, toaster, large fridge, 32" LCD TV, free FOXTEL & Wi-Fi, iron/iron board separate bedroom and is suitable for up to 2 persons in a Queen Bed. Room has basic cooking, air-conditioning, tea and coffee making facilities,M'wave, toaster, large fridge, 32" LCD TV, Free FOXTEL & Wi-Fi, and is suitable for up to 3 persons with varied bedding options. This refurbished self-contained unit contains 1 x Queen and 1 single bed in the main room and 2 single beds in a separate room. (Some units have a full size trundle, and if required, can be arranged in advance.) The unit is fully air conditioned with tea and coffee making facilities, hot plates, convection oven, microwave, toaster, pots, electric frypan, 32" LCD TV with free Foxtel and wi-fi, plus a large fridge, leather lounge, desk, DVD player and a private ensuite. Fully renovated Room with full cooking facilites, air-con, tea and coffee facilities, M'wave/Convect oven, toaster, large fridge, 32" LCD TV, free FOXTEL & WiFi, iron/iron board and is suitable for up to 4 persons with bedding Queen and 2 x singles. 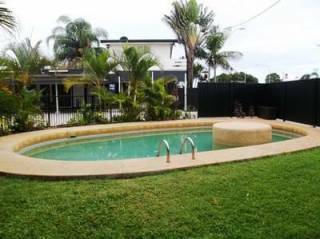 Rover Units is a delightful complex featuring 29 Self Contained one and two bedroom units and studios in the bustling town of Mackay all set on a large block catering for plenty of room for our salt water pool, a children's playground and barbecue facilities. A guest laundry is available on site. All units have cable television (Foxtel) and undercover parking. We also provide open air parking for caravans, boats, trailers and high vehicles on a first in best dressed basis. Our rooms comfortably cater for the single traveller to large groups, for overnight, mid or long term stays. Conveniently located on the Nebo Road Highway, Rover Units are within easy walking distance of dining, supermarket, and medical facilities and just a short drive from a popular array of further dining alternatives, airport, Mackay Base Hospital, Mater Misericordiae Hospital and shopping at the Mackay City Centre and the newly developed Canelands Shopping Centre and Myer. These refurbished units are completely open when booked as a family room, and the separate bedroom is closed off for twin share and studio unit bookings. Full cooking and dining facilities are provided. Deluxe Family Unit: This refurbished self-contained unit contains 1 x Queen bed in a separate room and 2 single beds in the main room, or 2 single beds in a separate room and 1 x queen bed in the main room. (Some units have a full size trundle, and if required, can be arranged in advance.) 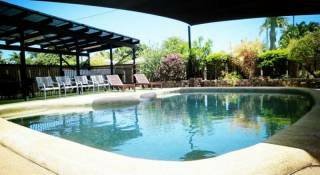 The rooms are fully air conditioned, have tea and coffee making facilities, hot plates, convection oven, microwave, toaster, pots, electric frypan, 32" LCD TV with free Foxtel and wi-fi, plus a large fridge, leather lounge, desk, DVD player and a large private ensuite. Deluxe Twin Unit: This refurbished self-contained unit contains 1 x Queen and 1 single bed in the main room that sleeps up to 3 people. The unit is fully air conditioned, have tea and coffee making facilities, hot plates, convection oven, microwave, toaster, pots, electric frypan, 32" LCD TV with free Foxtel and wi-fi, plus a large fridge, leather lounge, desk, DVD player and a large private ensuite. Deluxe Studio Unit: This refurbished self-contained unit contains 1 x Queen bed in the main room and sleeps 2 people. 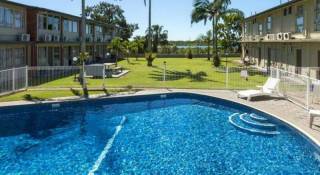 The unit is fully air conditioned, have tea and coffee making facilities, hot plates, convection oven, microwave, toaster, pots, electric frypan, 32" LCD TV with free Foxtel and wi-fi, plus a large fridge, leather lounge, desk, DVD player and a large private ensuite. These refurbished units are completely open when booked as a family room, and the separate bedroom is closed off for twin share and studio unit bookings. Full cooking facilities are provided. Standard Family Unit: This refurbished self-contained unit contains 1 x Queen and 1 single bed in the main room and 2 single beds in a separate room. (Some units have a full size trundle, and if required, can be arranged in advance.) The unit is fully air conditioned with tea and coffee making facilities, hot plates, convection oven, microwave, toaster, pots, electric frypan, 32" LCD TV with free Foxtel and wi-fi, plus a large fridge, leather lounge, desk, DVD player and a private ensuite. Standard Twin Unit: This refurbished self-contained unit contains 1 x queen and 1 single bed in the main room to sleep up to 3 people. The unit is fully air conditioned with tea and coffee making facilities, microwave, free wi-fi and TV with Foxtel, plus a large fridge, and a private ensuite. Standard Studio Unit: This refurbished unit contains 1 x queen bed in the main room and sleeps 2 people. 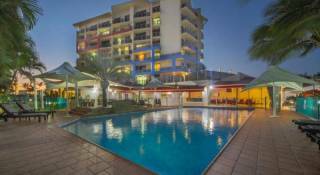 The unit is fully air conditioned with tea and coffee making facilities, hot plates, convection oven, microwave, toaster, pots, electric frypan, 32" LCD TV with free Foxtel and wi-fi, plus a large fridge, and a private ensuite. Our reception hours are 7.30am to 9.00pm. A valid credit card must be supplied upon check-in. If you require check-in outside of these hours please contact reception, to make suitable arrangements. On-site parking is available for guests, in front or near each unit. Limited parking for larger vehicles and trailers can be arranged as well as multiple vehicles. Please contact reception prior to your arrival to book additional spacing. Rover units maintains a "No Party Policy"
Free cancellation up to 2pm the day before check in. Note also a one nights tariff will be charged if accommodation is cancelled during stay without 24 hours notice. Whatever brings to you to the Mackay Region, whether work or play, you'll find all the modern facilities, shops, resources and activities you'd expect from a major city, with the relaxed feel of a destination. While Mackay City boasts over 300 variety stores and four major shopping districts, there is also a wide variety of night spots, bars and international dining opportunities. The Mackay Region supports the Coal Mining, Sugar Cane, Tourism and other Industries, and boasts the second largest Marina on the East Coast of Australia. The Mackay Region has 40 beautiful beaches for you to explore, in addition to being only a leisurely cruise from the Great Barrier Reef and outlying Islands, and a short drive to the Eungella National Park rainforest and Finch Hatton Gorge. Mackay continues to grow and prosper at a very productive rate and offers many employment opportunities and facilities for families. We look forward to welcoming you to the Mackay Region very soon, and remind you to bring your sunscreen and hat if you're planning on exploring the great outdoors! Located at Finch Hatton Gorge, West of Mackay. Ride on flying fox cableway/zip wire 350m long and up to 25m high. Located about 77km West of Mackay. It is well worth visiting the area which is full of romantic bush walks, and fantastic views of the Pioneer Valley. While you're there visit The Chalet with its magnificent view of the valley, and enjoy a home made meal on the patio. Located about 25km North of Mackay is a fantastic picnic place with excellent beach walks. To get there, travel 15km North towards Townsville, turn right at the Seaforth turn off, and drive another 13kms, after which you will turn right again and follow the road all the way to the park. This one is a must.